Much has been made of the burgeoning 'folktronica' movement in the last few years, though something has always struck me about the music, as good as it might be it isn't particularly folky for the most part and neither is it really that obviously electronic. 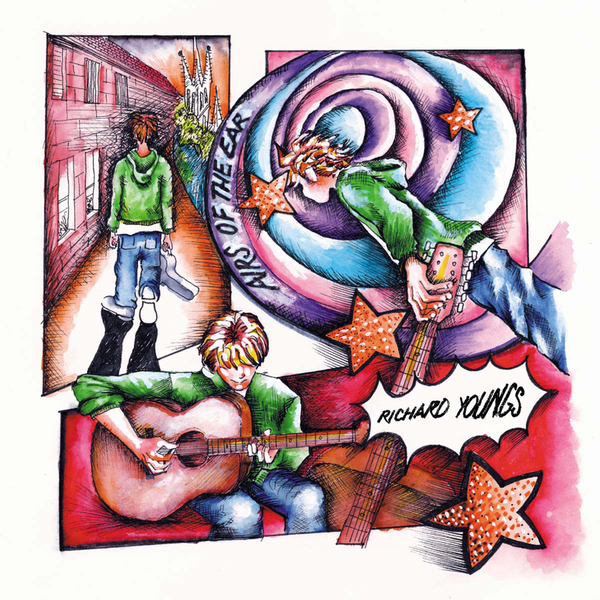 'Airs of the Ear' however, a 2003 album from the great Richard Youngs, is exactly that - those of you who have chanced upon his many solo guitar/vocal recordings (for instance the wonderful 'Sapphie') will already be aware of his folk tendencies no doubt, but here he is seen striking a perfect blend between the world of folk and the world of experimental electronics. I'm not talking Autechre or Aphex Twin either, with the aid of ring modulators and a Theramin he bridges the gap between the bleeping and wailing insanity of Delia Derbyshire and the folk reverie of the Pentangle, and as peculiar as that might sound it is impossible not to fall in love with. Youngs opens on the album's most obviously beautiful moment 'Life of the Stream' which places his signature acoustic guitar playing centre stage, underpinning it with harmonic drones and feedback. Eventually the vocal is layered over the top, but far from the usual un-fussy and plainly recorded vocal accompaniment this is processed and layered to create an otherworldliness that is as unique as it is endearing. A good comparison might be with the similarly Scotland-bound Alexander Tucker who recently wowed our ears with the gorgeous 'Furrowed Brow' - the two artists both show a tendency to experiment with form and are unafraid to tamper with what some might regard as sacred. The second track 'Oh My Stars' however is when Youngs really lets his hair down in an explosion of noise and electro-static excess, and the electronic elements take hold of the composition pushing and pulling the vocal and guitar elements in and out of earshot as they please. This conflict is exactly what makes the record so exciting to listen to, at no point do the two worlds sound out of place yet they are constantly fighting for superiority which makes for a truly breathtaking experience. The record closes on its most majestic track - the 20 minute opus 'Machaut's Dream' which shows off Youngs' tendency to err toward the beauty of the humble drone. Here the Theramin is finally allowed the opportunity to take a starring role and lends its wavering alien beauty to an extended Youngsian jam which is up there with the best he's ever committed to tape. As with last week's 'Sapphie' re-issue, 'Airs of the Ear' is an utterly life-changing piece of work and another truly essential segment of Richard Youngs' extended catalogue - just buy it.